I have always been fascinated with handmade pottery pieces. Beautiful pieces of clay, shaped from your own imagination. So 3 yrs ago, when my friend Blanca suggested to join a pottery studio, I was ready to have lots of fun! We were a bunch of ardent students learning how to throw clay on the wheel, willing our hands to shape the clay, learning about wedging, bisqueing, firing, glazing and Raku. Over time the loop trimmers, paddles, and throwing bats became our friends. More importantly, I could beat and pound the piece of clay and let go my stress! 25 pounds of clay would be consumed each week. 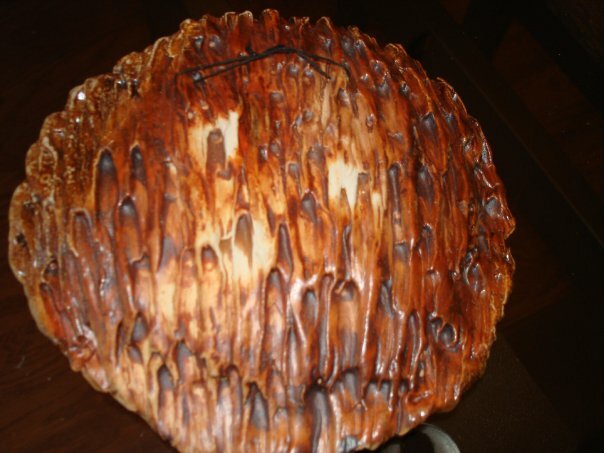 Result - I had 85 pieces of pottery lying around at one time and every family member and friend received a " unique pottery gift" from me for 1 year...*wink* Sharing some pieces that I have not parted with yet,... There are more all round my home,....bowls used as plant holders, plates kept under pots and protecting my wooden floor, bowls to make Dahi [my aunt swears her dahi is the best!! ], small containers - to store pieces of jewelry on the nightstand or as a soapdish, etc. very beautiful work!! You are very talented! !love the last one the most!! You do awesome work. I too had the pottery bug for a while. although i didn't take any classes, a good friend ran a studio and showed me the basics. it is addicting. My son got me a wheel and I have a small kiln. but i have never mastered the kiln thing. i ruin more than i create. have to get back into it tho. you are an inspiration to do so. gorgeous work! beautiful! :) I would love to join a pottery course too! .. Nice to have handmade stuff around the house rt? Some of these have the most beautiful Glazes! I haven't done any pottery for so long! Amazing!!!! What talent we find on these blogs. Post after post. Lovely pieces Anu. loved the tall tea mug. very different. Liked it? I loved it! Especially those pieces in your last pic...where did you get them from? Anu....lovely lovely stuff! I always wanted to learn to throw a wheel, took one class in college in Seattle, that was it! You are so talented, do you sell them? Anpu- Hoot Hoot! Beautiful work! Saying this for the Nth time- I am completely amazed by how multi-faceted and talented you are. 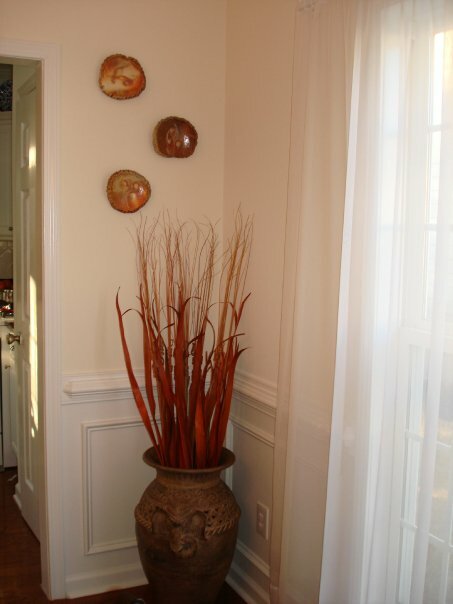 It is really really hard for me to picks a favourite- I like the ones on the wall, the mugs, the tall vase- everything! Also, thanks for your lovely comment on my blog. Glad to have discovered your blog too! Will be dropping by often ...! I love the look! I always thought I would make a set for when I get married but I only did 1 mug! @Sharon - Terracota bells and my friend has these cool bells from some ethni plae in Chennai. 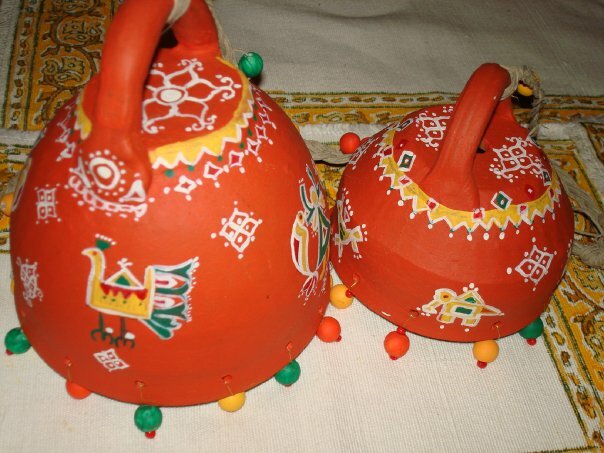 Made the bells and painted them with rangoli and tribal embroidery patterns. The beads are wooden and I painted them in different colors and tied it to the bell with copper wire. And just weaved the extra wooden beads to Braided jute that is used to hang the bell…. @Kamini - Thanks…Go for it, you are damn good, you can make your own pieces. I need 2 more years to polish, to be able to sell…so some day, one day will do. Until then, they make neat gifts. Anpu--don't know how/when I missed this post--I am in awe of you now! Seriously gorgeous work---you take DIY to another level altogether girl!!! These are gorgeous pieces and very me character. I love earthy things and admire people who can create great things with clay. Thanks for sharing. From one potter to another. LOVED your work. Wow! These are absolutely fabulous Patty!